Have you met Ryan Gander, the real Ryan Gander? If the answer is yes, then there is a small chance you actually were witness to Ernest Hawker (2015). Artist Ryan Gander was invited by curator Mark Beasley to participate in the 6th Performa Biennial in New York and and took the project to Miami during Art Basel Miami Beach, using a doppelgänger who happens to be ‘performing’ as a failed artist, his future self. It wasn’t as dire as it sounds. Ryan Gander, Earnest Hawker, 2015. A Performa Commission. Photo by Paula Court, Courtesy of Performa. Ryan Gander is an artist who still hasn’t had much exposure in the US but that is starting to change. An exhibition of his work opened on the West Coast at the Aspen Art Museum and will be on view until February 7th, 2016. Based outside of London, he presented two separate performance pieces as of late, one as part of Art Basel Miami in 2014 and the other which is currently in progress as part of Performa 15. In the first, he hired two security guards to follow around Nicholas Baume, the Director and Chief Curator of Public Art Fund. He said that the presence of the security guards immediately gave the curator an edge, and those in the general public (along with photographers) found him to be more interesting due to this element since the body guards symbolized importance. In New York, during Performa 15, Gander once again hired someone. This time, it was for a work titled Ernest Hawker. The gentleman who was part of the project, attended nearly two events a day, both in Basel and at Performa, anonymously telling people he actually is Gander -albeit in the future- a failed artist looking for a sympathetic ear and to sell his wares. That’s right, the avatar Gander was selling key chains for $20. A steal for anyone interested in the true Ryan Gander’s work, but a hustle for the doppelgänger artist. The goal of the performance was to bring attention to the concept of the artist in the room (particularly at an art event) who may not be doing as well as some of the others. Future Gander, talked about his woes to anyone who might listen. Most of us have met this character before, even if under a different name. The artist who has been alone in their studio all day and then emerges for an art opening without realizing they’ve talked your ear off in a run-on sentence of complaining. For the Performa project, Gander is questioning his success, the success of others and the patience of those present at art events. If you’ve come across Ernest Hawker or Ryan rather, who also was in Miami for Art Basel, did you say hello or buy a key chain? I finally crossed paths with the artist at Tania Bruguera’s InstaCitizen, Instagram take-over and we had a chat, and yes, I did buy one. Katy Diamond Hamer: Excuse me, hi, I heard you might be Ryan Gander? 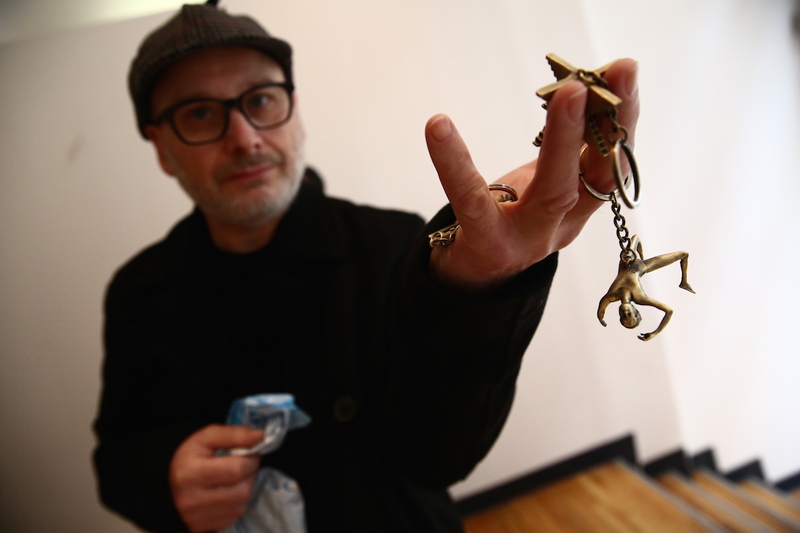 Ryan Gander (of the future): Yes, indeed, I am Ryan Gander. And you are? KDH: My name is Katy Hamer, nice to meet you. Are you participating in this Instagram project? RG(otf): Lovely Katy, nice to meet you as well. I haven’t participated yet, but I’m doing my thing here. I use other people’s art events to service my own needs. I’m selling these items that represent the big regrets in my life. The biggest one being what drove me out of England and to New York where I am currently based, but not very productive. I had wanted to open an art school. I tried to be altruistic about it. We got the money and it was supposed to be an art school for, I wouldn’t say disadvantaged, but kids who weren’t going to go to art school based on family or other reasons. We developed this school and bought a property outside London in Suffolk where I had been living. What happened regarding this particular school, or rather I will show you this is a model of my architectural model. [Pulls out key chain] We designed several single story buildings with a sculpture park in the center and a couple of galleries for the students to use also. There would have been six students for six months. We bought the property real cheap, but soon after I realized I was running out of money, so I mortgaged my house. That was a big mistake. Our supply of money got even lower and we ended up losing the house. So after that happened, my wife left me. KDH: Oh my God, that is terrible. I”m really sorry to hear it. RG(otf): Yes and I thought, I’ve had enough and I’m going to try my luck in the new world. So I’ve been here a few years but haven’t been very productive although I did create this set key rings made of brass, to represent the biggest regrets of my life. That was one of them. So I’m here, trying to sell them for twenty dollars a piece. RG(otf): [Continuing] You see I made an awful lot of money that went down the tubes, where the project, as we say in England, went pence, and one of those was with ballet dancers, based on Degas ballet dancers actually. [Reaches into bag and pulls out another style key chain, this one the thin outstretched body of a dancer, frozen in position.] I’d have dancers come into the studio, we’d have dance sessions. I had in mind a series of thirty seven sculptures in the end. My gallery was selling, these sculptures at 100,000 Euros each, so it was a good sum of money. They were two feet tall, always on a plinth and mounted with a blue cube. Yet, I could never make number thirty seven which was meant to be a dancer falling through space, but I finally did in the key ring form. This dancer is falling through space. The regret here was about my artistic integrity and that I could never finish, the project and it is always bad when you can’t finish a project. 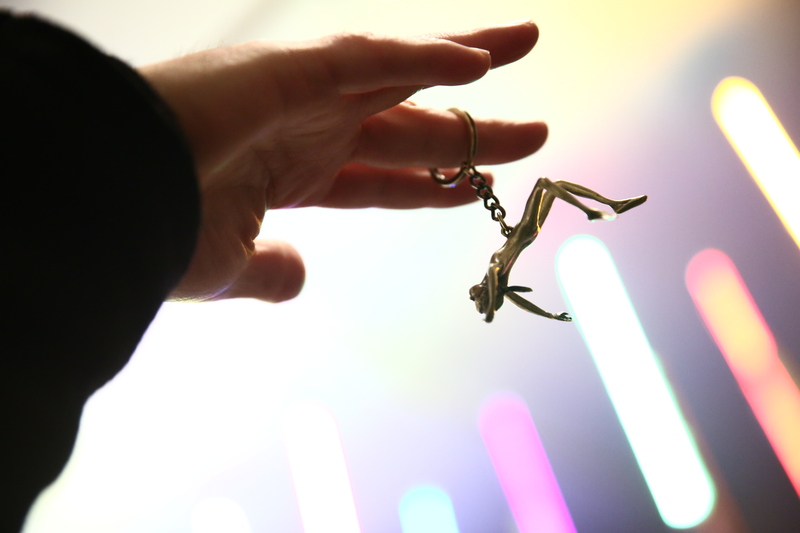 KDH: So far it seems that the key chains are about these hopes you had for yourself but never achieved. RG(otf): Exactly. Now I’m trying to make money out of them so I can blow all that away. If I can make money off of them, then I can’t say they are regrets anymore. KDH: True! That’s actually a fascinating way to think about reclaiming or reinventing the past. RG(otf): Yeah and there’s one more key ring. This one, picking a the oldest one and goes way, way, way, way back. When I was fifteen I was on a school trip to Colwyn Bay Beach in Wales, Emma Jane Watson and I went behind the erosion wall and away from where anyone could see us. We were fifteen and didn’t go all the way at that point, but we did have a bit of fun back. After that, Emma Jane wanted to go steady. RG(otf): A fifteen year old girl is thinking ‘yes’ and a fifteen year old boy, well, I didn’t think it was such a good idea at all. Three weeks later she was with a mutual friend of ours, Matthew Low who she ended up marrying. They have four children and live in Wales. Ever since then, I’ve always been still in love with Emma Jane Watson and every time I see this particular shape, I think of her. [Key chain shaped as a geometric staircase, similar to “Relativity” (1953) by M.C. Escher] It also represents the spirit of the staircase, which basically means you wish you had done something different, in hind sight. So that is, the regret of young love. KDH: I like this one! [Fondling the key chain representing failed architecture] I’d like to buy one. Have you been selling a lot of these mini sculptures? RG: I’ve sold a bunch and sometimes if people are really interested in all three I’ll sell them for $50. KDH: So you give them a deal! I’m not going to get the stairs, but it’s hard to choose between the fallen dancer and the never realized architectural project. RG: It is a Ryan Gander, so when I die the $20 might be worth $200. KDH: Very true, well, I’ll take this one. [Selecting the failed art school, and voluntarily, gleefully even, handed over the twenty dollars]. Peforma 15 was on view in various locations around Manhattan and Brooklyn through November 22nd, 2015. Ryan Gander is represented by Lisson Gallery (London/Milano/New York) and Annet Gelink Gallery (Amsterdam).